After a dispiriting end to yesterday’s walk, I start today with no great expectations. And today doesn’t seem promising either. The weather is dull. My hotel is on the edge of a huge car park that feeds a new shopping centre. All I can see are parking bays, busy roads, and fast food outlets. It takes me a few minutes to orient myself. Then I come across this impressive signpost. It’s a National Cycle Way sign, not a Wales Coast Path sign, but at least I know I’m on the right track. I find myself walking across a large open space, surprisingly empty at 9:30 in the morning. There is a row of stone columns around the edge and a very tall metal pillar in the middle. Although I’ve never been to Cardiff before, it all seems vaguely familiar. Then I recognise the tall metal pillar. For those who don’t know, Torchwood is a secret organisation dedicated to investigating strange goings-on in Cardiff and to the elimination of alien threats. It’s like a cross between the X-Files and Buffy the Vampire Slayer, but with Welsh accents and with the handsome Captain Jack as its gay boss. Of course, I can’t resist taking a photo of myself reflected in the gleaming metal of the tower. In the photo above, I may be actually standing on the Torchwood entrance – or it may be round the other side – but in any case the notorious perception filter does its job and I can’t find it. Pinned up are tributes here from all over the world, and even an official-looking plaque. Ianto was a Torchwood operative. He died, reasonably heroically, but it’s not exactly clear to me why he has collected so much attention. He was the odd-man-out, the outsider who didn’t like violence, was slightly stodgy, a little slow, and the person who everybody ignored most of the time – in the beginning anyway. And, most importantly, he was gay. He is, of course, an entirely fictional character. Anyway, I spend far too long looking at Ianto’s shrine, before realising that I am heading in the wrong direction around Cardiff Bay and have to backtrack. 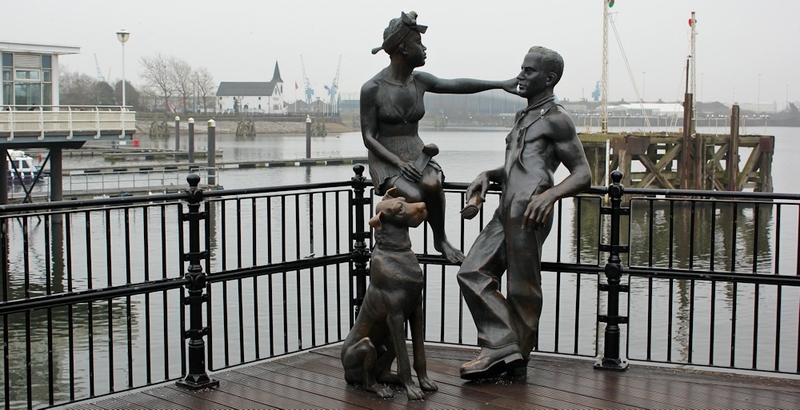 I pass this realistic bronze sculpture: People Like Us by John Clinch. 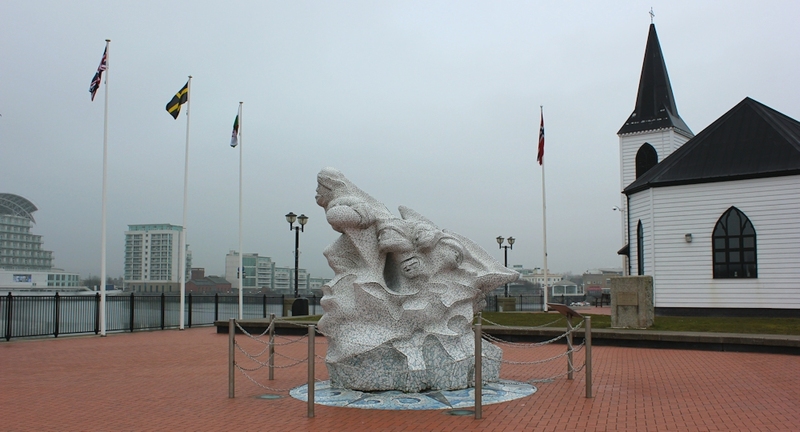 The weather is too dull for decent photography of the views across Cardiff Bay, so I have to content myself with taking photos of the artwork and sculptures. There is plenty to look at. 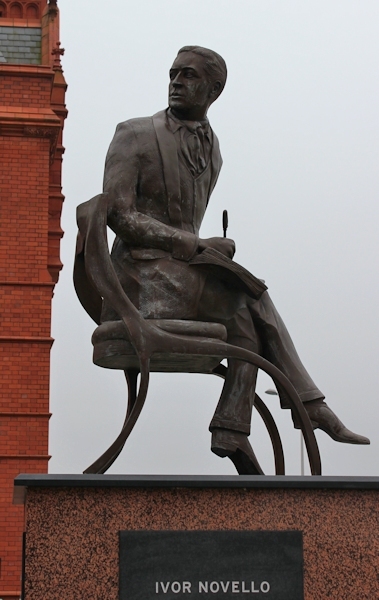 Here is Ivor Novello, who sits high on a plinth in Roald Dahl Plass, and I think this sculpture is intriguing because of the twisted position of the composer. Around the corner I come across the National Assembly Building, with an impressive modern design. In front of the Assembly is a wonderful metal sculpture, welded and riveted. While one side looks like the ribs of a wrecked ship, the other side looks like a continuation of the wrecked hull, but is actually a large face lying face down with closed eyes. 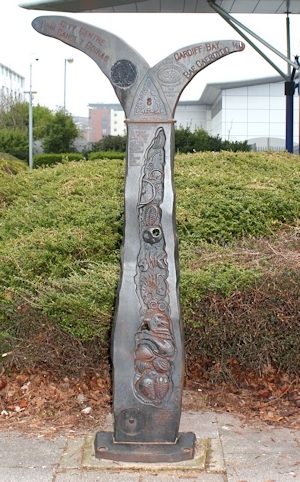 This lovely piece (photo below) is the Merchant Seaman’s Memorial by Brian Fell. It’s very evocative and exactly right for a sailors’ memorial. 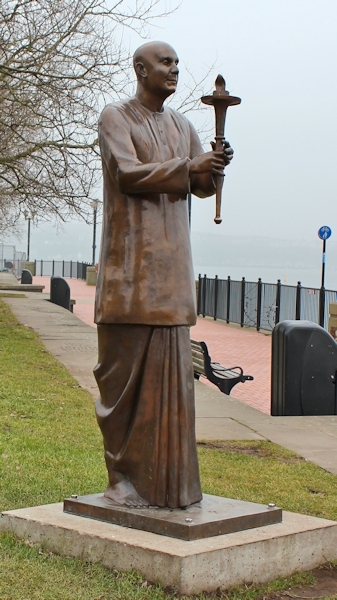 Onwards, along a walkway by the water that seems very new, and I come across this bronze figure. It’s a larger-than-life-size statue of Sri Chinmoy, a spiritual leader who advocated physical exercise. He started a global running event called the Peace Run (also sometimes known as the World Harmony Run) and, although he died in 2007, his Peace Run continues. Moving on from Sri Chinmoy, I continue along the water front and towards the wooden, church-like building that I had first noticed from the other side of the bay. I discover this is the Norwegian Church, first established as a religious and cultural centre for the Norwegian sailors who worked here in the days when Cardiff was a busy port. But the church fell into decline, along with the docks, and was deconsecrated in the 1970s. It is now an arts centre. Outside the Norwegian Church is another monument, a rather weird design and covered by a mosaic of white tiles. At first I assume it represents a Viking warrior, although I don’t know why he’s wearing a balaclava. But it turns out to be a memorial to Captain Scott and his Antarctic expedition. The white represents the Antarctic snow fields. Captain Scott was beaten to the South Pole by a Norwegian, and it so it seems unkind to put his memorial next to the Norwegian Church. Rubbing his nose in it. Strange. Still puzzled I continue. Further along, I come across a Tardis. There are a lot of them dotted around South Wales. This one marks the entrance to the Doctor Who Exhibition. I have to confess that today I was hoping for rain. That would have given me an excuse to stop walking and look around the exhibition. I’ve watched the series on and off for years, starting with the first Doctor Who film. The Daleks were the first real monsters I came across. Absolutely terrifying. The weather is murky and I can hardly see across the bay. But it’s not raining. I walk on. I follow the Wales Coast Path as it leaves the buildings behind. And pass a playground with a climbing wall and a wonderful message: impossible is nothing. 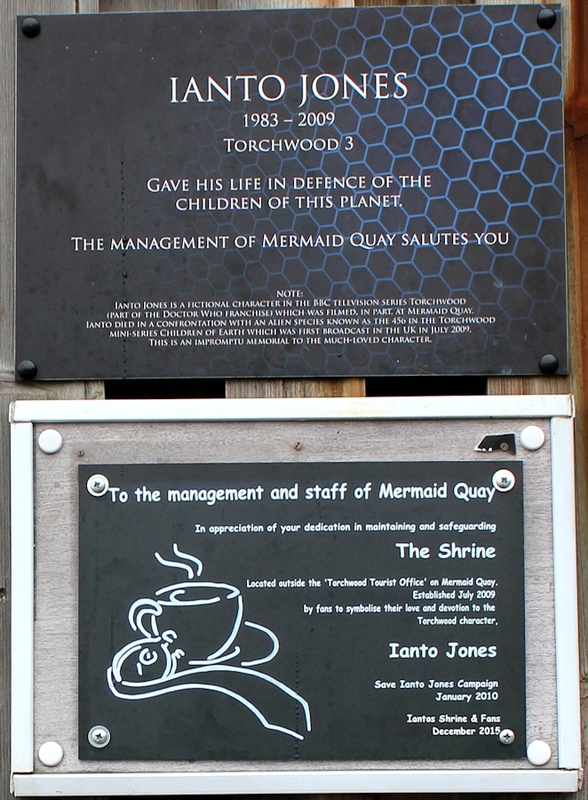 You can find out more about Torchwood here. Later I learn that Captain Scott began his doomed expedition from Cardiff, from where he set off on his ship the Terra Nova, which was launched close to where the Norwegian Church stands. That explains the position of the monument. 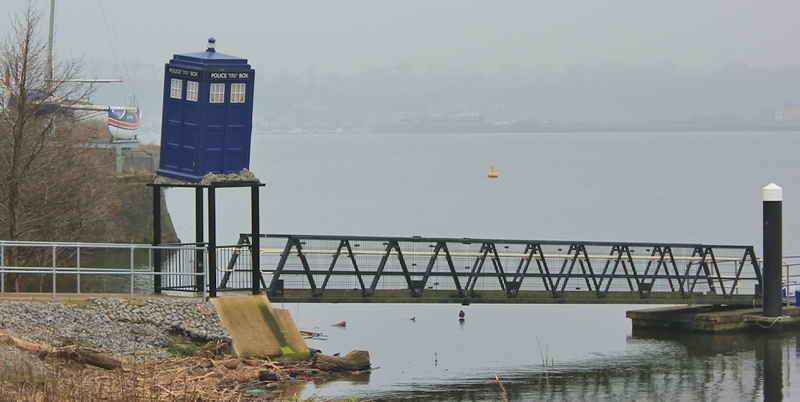 This entry was posted in 12 South Wales and tagged coast, Doctor Who, travel, Wales, walking. Bookmark the permalink. Love all the sculptures and Torchwood connections. You’ve just convinced me to plan a weekend in Cardiff! It is certainly worth a visit. I didn’t even get to look around the centre of Cardiff, so I guess there is far more to see. I was very impressed by all the public art work. I did also head the wrong way around the Bay. It seemed to me that way-marking of the WCP was excellent between Chepstow and Cardiff Bay, but then it suddenly disappeared (or maybe I was just too busy looking at the buildings to notice?). Thankfully, I’d only gone a couple of minutes when I looked at the map and performed a sharp about-turn! I was impressed with Cardiff Bay.. Iremember when the barrage was built I wondered if it would prove to be a huge waste of money. 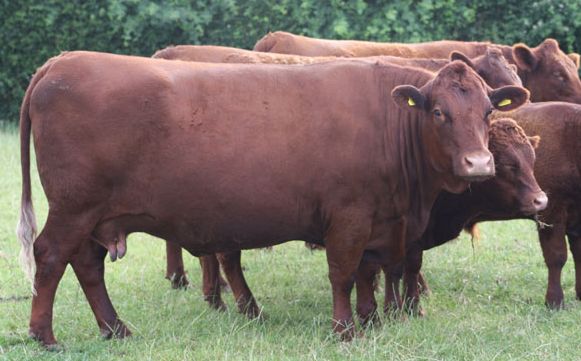 However I’m pleased to see it actually worked very well and it’s an interesting mix of old and new. Like you I was impressed with the Millenium Centre, it is very striking. The letters above the entrance also light up at night. It really was impressive, wasn’t it. And I’ve been following the news about the construction of a possible tidal energy lagoon with interest. That could be very beautiful – or truly hideous. We’ll have to wait and see. 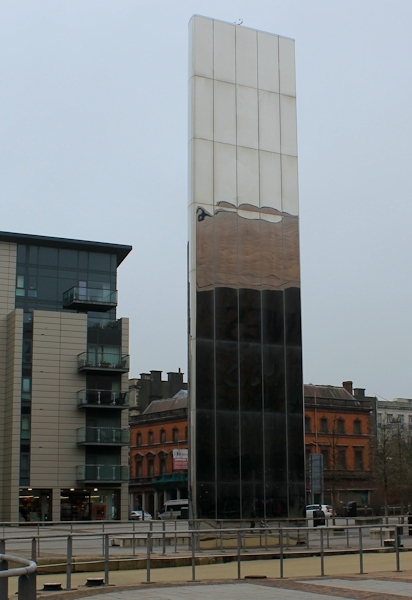 The sculptures are varied and interesting, but how exciting to see the Torchwood Tower and the Tardis. (what is the plural of Tardis?) I’m an on and off fan too, depending on who is playing the part of The Doctor. A lady who lives near me, has the claim to fame that her son is the ‘Voice of the Daleks’ (and the Cybermen), his name is Nicholas Briggs. I had known her for years before she mentioned it.